This entry was posted in A Song of Ice and Fire, Game of Thrones, Podcast, TV Shows and tagged Ciao_Gamer, jesicka309, Scilens, Shoeshiner, The Reader, Valkyrist. Bookmark the permalink. Great episode Krakens! I love the Benjen-is-Darkstar theory 😉 And Valkyrist, what was the song that you used in the intro and outro? I generally really enjoy the KrakenKast reviews, but listening to pointless character hate really lowered my enjoyment of this particular review. I’m all for the voicing of opinions, of course, and everyone is entitled to their own, but I genuinely think that judging characters by how much their character and character arc subverts tropes is really short-sighted. ASOIAF contains subversive elements, but I don’t think subverting of tropes and expectations is the main point of the series. As I said, I really enjoy the KrakenKast reviews, and I did enjoy most of the rest of it, but I do think that there’s a difference between expressing a negative opinion about a character and engaging in character hate and that line was crossed. Character hate adds nothing of value to the podcast and says more about your hosts than it says about the characters themselves. Especially when essentially meaningless terms like Mary Sue and Gary Stu are flung about. The issue with those particular terms is that they’re so often misapplied (like in the case with Jon and Dany) in fandom circles that they no longer have much impact. In general, people are so quick to label characters as Mary Sues or Gary Stus that its functionally lost its meaning. I generally do an eyeroll any time the term is brought up because the vast majority of the time, it’s being misapplied to the point where it’s just an easy negative label for a character someone dislikes. That said, I don’t think it’s wrong to have negative feelings about characters — I have some strong qualms with Dany’s eye-for-an-eye mass crucifixition, for instance — but yeah, I think it’s more productive to discuss issues like those rather than an intrinsic dislike for a character. Thanks for responding, though. I generally really enjoy your perspective on these things and I was hoping you’d come up with a defense! In the podcast you had a question how the gold was transported to Kings Landing from Casterly Rock. They are most likely using the so called Gold Road, which is south of the Riverlands. 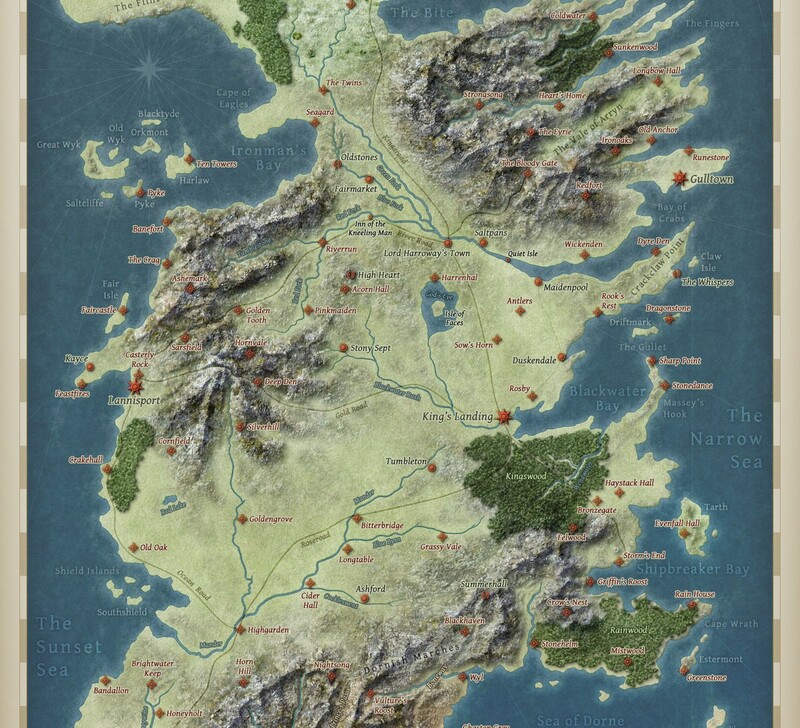 Se here: http://awoiaf.westeros.org/index.php/Goldroad and here: http://cdn.obsidianportal.com/map_images/284738/WesterosMap.jpg. It is the road that goes west from Kings Landing. In the podcast you also mentioned that the Lannisters are broke in the books to, where you equalize the Lannisters with the crown, which is simply not correct. It is the crown who have the debt to the Iron Bank, not the Lannisters. The Lannisters have plenty of money left and their goldmines are still producing gold and in ADWD Kevan are thinking about paying the Crowns debt with Lannister gold which they could do without a problem. Did you notice that Cersei said that she has been queen for 19 years? In season 2 is it not said that she married Robert when she was 19? That would make her 38 or thereabouts not 40. I suspect that they have just rounded up hers and Jaimes age to 40 from 38. Or are they not counting the time that she has been Queen Regent in those 19 years? Which in the books is little more than a year. In any case less than a year and a half at this point in the corresponding chapters in the books, just after Joffreys death which happens in the first day in year 300 AC (after Aegons Conquest). Didn’t Tyrion mention in the first episode of season 2 when Joffrey’s nameday tourney took place that it was Joffrey’s 17th nameday? In the books it was Joffrey’s 13th nameday tourney and his marriage to Margaery Tyrell happens less than 1 year later. Are we to think that more time have gone by than in the books between his nameday tourney and his marriage? But what about Sansas age then? When Sansa gets married in season 3, she mentions that she is 14 and in the first episode of season 1 she said to Cersei that she was 13. Hmm! Elia Sand is called Lady Lance. Obara is oldest, then comes Nymeria, Tyene,Sarella, all with different women. After them there is: Elia, Obella, Dorea and Loreza, all with Ellaria Sand. See here: http://awoiaf.westeros.org/index.php/Sand_Snakes. I don’t think that Brienne and Podrick are in the Riverlands yet. I think it would be totally out of character for Cersei not to count her time as Queen Regent as part of the 19 year, given how proud she is of being THE QUEEN and having all that POWER … But I wouldn’t put too much value on any of the ages mentioned in the show. They made the decision to add 2 extra years between Robert’s Rebellion and the beginning of the series, but from there on out, the rest is pretty vague (as it is in the books). Sansa saying she was 14 on her wedding night was definitely an inconsistency, the rest is just approximation.